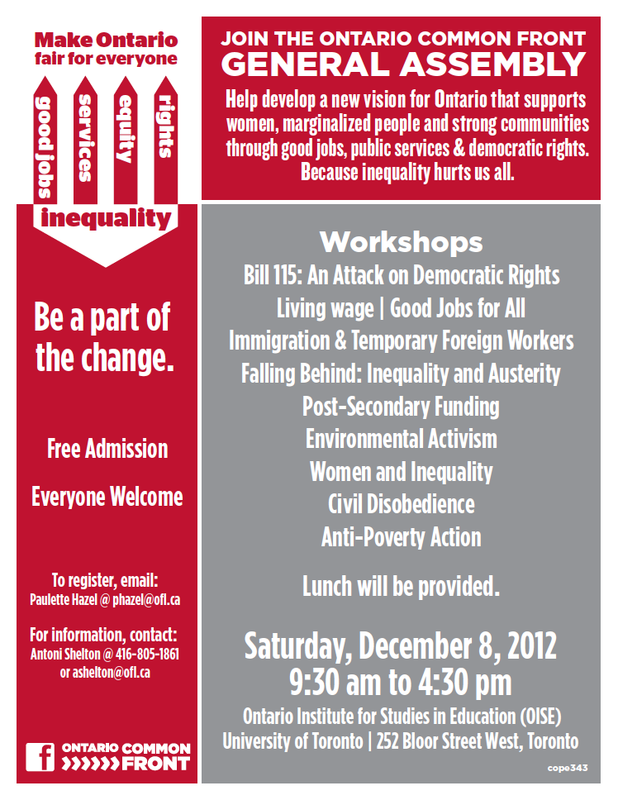 You are invited to the Ontario Common Front (OCF) General Assembly on Saturday, December 8, 2012 from 9:30 a.m. to 4:30 p.m., at the Ontario Institute for Studies in Education (OISE) University of Toronto, 252 Bloor Street West, Toronto. We are facing an increasing crisis in Ontario and the rest of Canada. Almost every day journalists report that the gap between the rich and the rest of us, threatens our way of life. Between 1981-2012 Ontario has witnessed the largest increase in income inequality of any province. Ontario also provides the lowest per capita funding of public services such as health care, education and disability benefits. The government has said there is no money for the recommendations flowing from FrancesLankin and Munir Sheikh’s Commission for the Review of Social Assistance in Ontario; while the Bank of Canada Chairman, Mark Carney, criticizes business elites for sitting on over $500 billion cash that they refuse to spend to help stimulate the economy. This is cash that was facilitated by government corporate tax cuts. However, there are many opportunities to win progressive change. With a Liberal leadership convention in late January and a provincial election expected in the spring, the time is right for us to develop strategies and tactics that support public revenue generation and its fair and equitable distribution. The OCF model of community-labour organizing is breaking down divisions between unions and community. OCF is a mix of over 90 community and labour organizations working together to combat growing inequality in Ontario; while providing alternatives. For years, labour unions in Ontario have identified the need to reach out and work with diverse communities in a meaningful way. OCF is now making this happen across Ontario. There are currently OCF chapters in Toronto, London and Kitchener-Waterloo, with development work happening in Thunder Bay, Cornwall, Hamilton and Brampton-Mississauga. 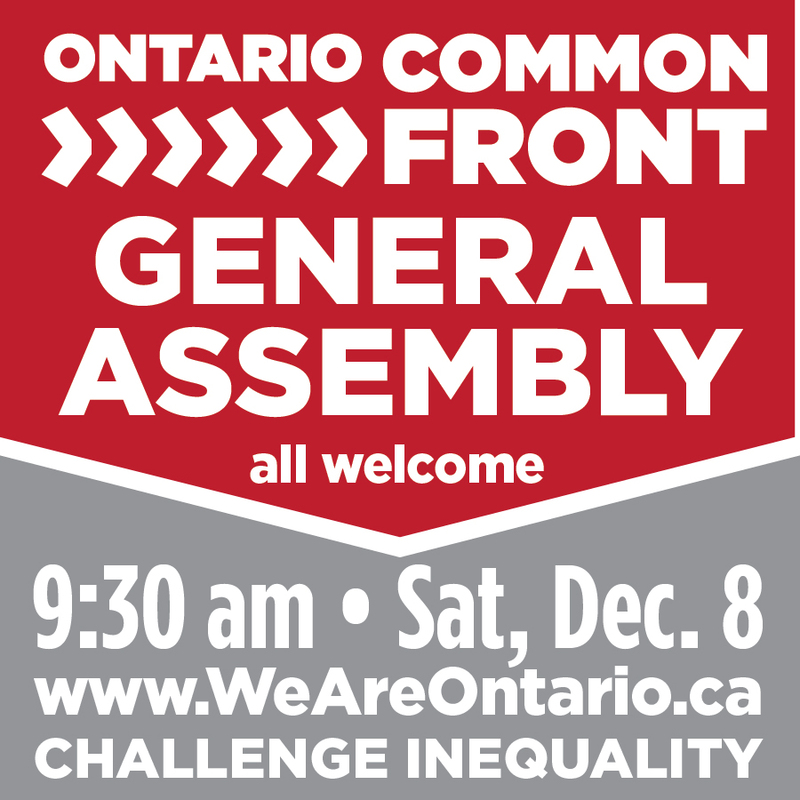 At this December 8 General Assembly, labour and community groups will come together to discuss a number of pressing issues that are threatening the very fabric of our society. For example, there will be a strategy workshop on Bill 115 and similar legislation aimed at the broader public sector. This workshop, like all others, will be facilitated by both labour and community activists and will include educational and strategic components. These workshops provide an opportunity for discussion and organizing around an array of important issues in our collective struggle against inequality. the “People’s Assembly” – London Common Front. 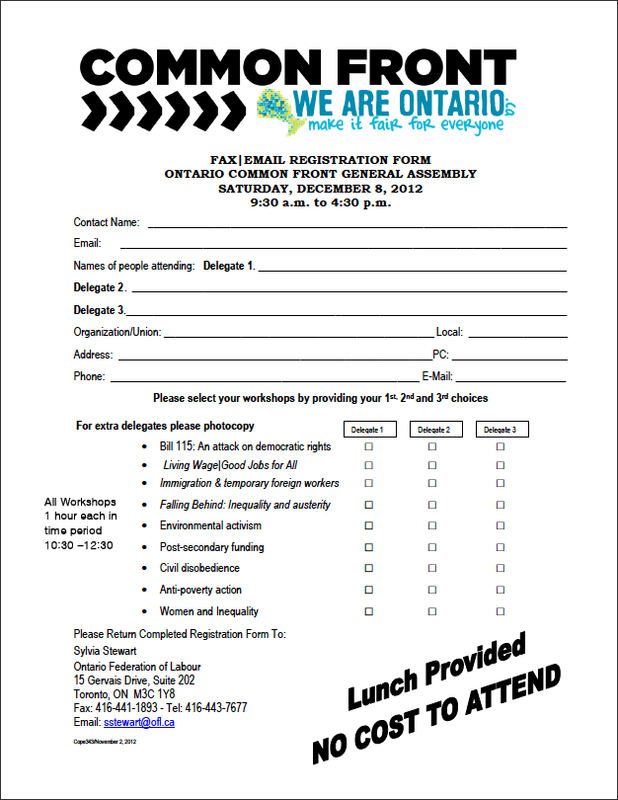 This is an assembly that connects union and community activists/organizers and any individuals concerned about the political direction of this province and country. Workshops will run from 10:30 a.m. to 12:30 p.m., and we expect them to fill up quickly. Please select your 1st choice but your 2nd and 3rd option also. See the attached flyer for workshop topics. A registration fax-back form is also attached. Please register early to ensure your workshop choice.